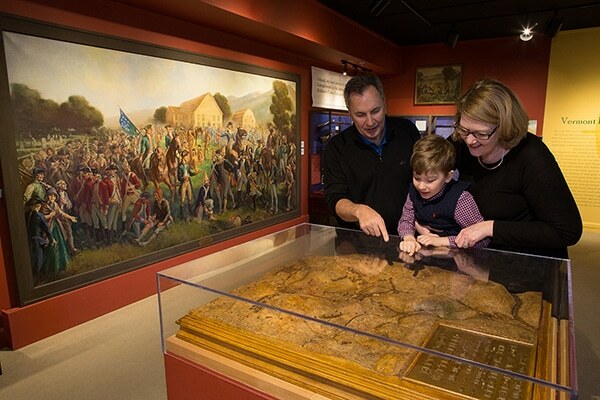 The Sloane Gallery focuses on the Revolutionary War battle named after the town of Bennington. The Battle of Bennington was one of the pivotal early battles of the Revolutionary War. As British forces marched toward Bennington, they were intercepted just across the border in what is now New York State and were soundly defeated by the Colonists on August 16, 1777. Named after the town of Bennington, the museum maintains a strong collection of objects and documents relating to the battle and has on view weapons, military equipment that was used in the battle, including one of the four cannon captured by American forces, and printed accounts of the battle.